Thundershirt's gentle, constant pressure is a terrific solution for many types of cat anxiety, fearfulness, scratching and more. With its patent-pending design, Thundershirt's gentle, constant pressure has a dramatic calming effect for most cats if they are anxious, fearful or over-excited, over 80% of cats show significant improvement in symptoms when using Thundershirt. Thundershirt is recommended by thousands of veterinarians. 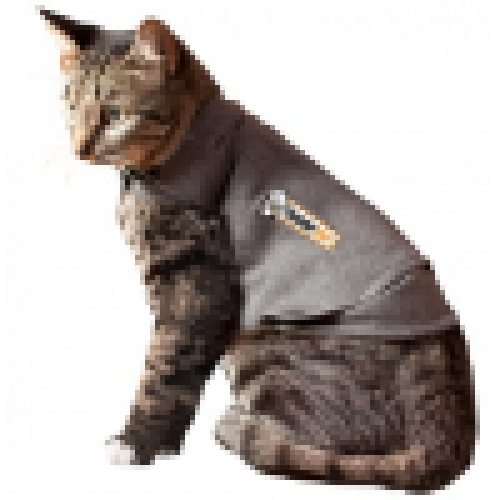 Thundershirt is an excellent treatment for most types of cat anxiety and fear issues. For many anxieties, just putting on a Thundershirt and observing the results (no training!) can make all the difference. You very well may see significant improvement for noise, crate, travel and others with absolutely no training. For more complicated anxiety cases, it is recommend using Thundershirt as part of a behavior modification program. One thing is for certain, for a very large percentage of cats, Thundershirt's gentle, constant pressure has a terrific calming effect. This has obvious benefits for most types of anxiety. Thundershirt has been developed to be very easy to put on. The Velcro fasteners make Thundershirt very adjustable to many different body shapes. Chest size is the best measurement for selecting a size. simply measure your cat's chest just behind the front legs at the widest point. S - 9ins up to 13ins.